Ethiopia’s goverment held peace talks with members of the Ogaden National Liberation Front (ONLF) in Asmara, Eritrea’s information minister, Yemane G. Meskel said on Tuesday. Meskel tweeted information from a statement issued by ONLF after the meeting, indicating that ‘the parties reached a common understanding on the issues discussed’. ‘‘They agreed to work together peacefully to protect the interests of the people of the Somali Region and collaborate on national issues including the future of Horn of Africa integration,’‘ read part of the ONLF statement. 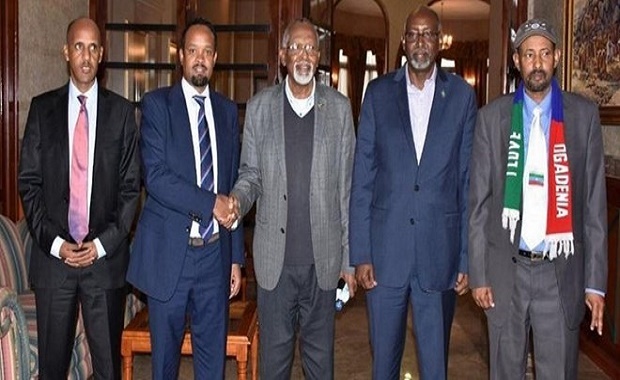 The Ethiopian delegation included Ahmed Shide, Federal communication minister & Chairman of the Somali People’s Democratic Party while the ONLF team was led by its chairman Admiral Mohamed Omar. ONLF, a separatist group established in 1984, had been labeled a terrorist organisation by the Ethiopian government, until recently when parliament passed a resolution removing three organisations including Oromo Liberation Front (OLF) and Patriotic Ginbot 7 (PG7) off the list. ONLF has since declared a ceasefire and is now having formal talks with the Ethiopian government. This week, ONLF’s foreign secretary, Ahmed Yassin Abdi told Bloomberg News that the organisation ‘will demand a referendum on self-determination’. ‘‘We want to achieve self-determination recognized by international law under the current Ethiopian constitution,” Abdi was quoted as saying. Ethiopia, Eritrea, Somalia pact boost for regional peace, devt.